Pacers Gaming (PCG) took on Jazz Gaming (JZG) in the regular season opener. The squad was firing on all cylinders from the start until the very end. The first half was tight with PCG leading by 4 at the break. Ramo led all scorers in the first half with 12 points, but it was Swizurk’s second half performance that gave PCG their spark and propelled them to an 80-42 victory. Ria, the first overall pick in 2019 gave JZG all the fire he could, nearly posting a triple double, but in the end PCG had 4 out 5 players in double digits. When Pacers Gaming is clicking the way they were against JZG, they are nearly impossible to stop. Overall, this was a great team win for PCG. PCG was led again by Swizurk and his enormous offensive output of 30 points and 5 assists shooting 6/10 from 3 point range. Ramo also contributed in huge ways with 19 points, 15 rebounds, 8 assists, 4 steals, and a huge block in the first half. WoLF 74 had a strong performance with 12 points, 3 assists, and 2 steals. Lord Beezus was a major presence with 15 points and 5 steals. Matty led at the PG position, dishing out 7 assists. For JZG, Ria led the team with 15 points, 9 rebounds, with a steal and a block on the defensive end. 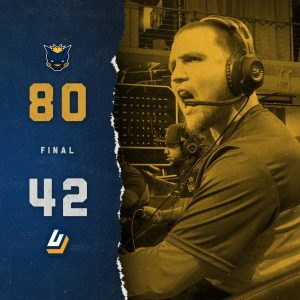 Tune in Wednesday, April 17 to watch Pacers Gaming take on Cavs Legion GC at 6 PM EST on https://www.twitch.tv/nba2kleague.